Acmena smithii or ‘Small leafed Lilly Pilly’ is a native plant used widely for hedging and topiary. Because the species is one of the most disease resistant it is popular with landscapers as a hardy native alternative for a screening plant, hedge or windbreak. Over the years a number of cultivars have been introduced, many do not flower and fruit as prolifically as the species which makes them better suited to some landscaping applications. Used widely for screening out neighbours in urban situations. A. smithii ‘Hot Flush’ – Good new red growth that turns green with age. After 3 years Acmena smithii will reach around 3m, depending on soil, conditions and location. Plants should be pruned twice a year when young to ensure a nice bushy habit if you are using them for a hedge (spring and early autumn) after 3-4 years pruning once a year seems adequate. Mulch well to maintain a cool root run and growth should be faster. 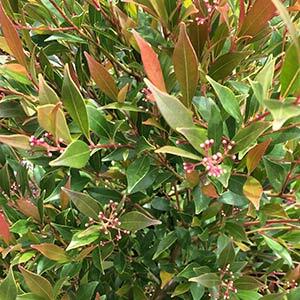 Naturally found along the east coast of Australia this is an adaptable tree, with attractive glossy dense foliage, if left unpruned it will reach 8 -15 m depending on conditions. Smaller growing cultivars are also available.